Turkey has “certain evidence” that the Saudi journalist Jamal Khashoggi was killed in his country’s consulate in Istanbul, an unnamed Turkish official told the Associated Press. The comment was made shortly after Turkish investigators searched the consulate on Monday and early Tuesday. Khashoggi disappeared after entering the Saudi Consulate to obtain divorce papers on October 2. US Secretary of State Mike Pompeo is in Riyadh, Saudi Arabia, to hear the Saudi side of the story. The Turkish police have “certain evidence” that the disappeared Saudi journalist Jamal Khashoggi was killed inside the Saudi Consulate in Istanbul, an anonymous official told the Associated Press on Tuesday. The source did not provide further details on the evidence found during a search of the consulate, which began Monday and ended early Tuesday. Khashoggi, a US resident who has written columns for The Washington Post and been critical of the Saudi government, disappeared after entering the Saudi Consulate to obtain divorce papers on October 2. Earlier Tuesday, Turkish President Recep Tayyip Erdogan reportedly suggested the Saudis might have tried to cover up a murder in their Istanbul consulate. A Turkish newspaper cited Erdogan saying investigators found surfaces newly painted over, which could indicate an attempt to conceal evidence. Saudi officials have denied knowledge of Khashoggi’s whereabouts and claimed he left the consulate shortly after he went in. On Monday, however, CNN reported that the Saudi government was preparing a report that would acknowledge Khashoggi was killed but attribute his death to a botched interrogation. 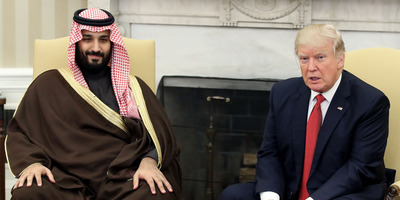 Mark Wilson/Getty ImagesPresident Donald Trump, pictured with Saudi Crown Prince Mohammed bin Salman, is facing mounting pressure to react more forcefully to Khashoggi’s disappearance. US Secretary of State Mike Pompeo arrived in Riyadh, Saudi Arabia, on Tuesday to hear the Saudi side of the case. He may visit Turkey next. President Donald Trump has seemed hesitant to hold Riyadh liable for Khashoggi’s disappearance, suggesting on Monday that “rogue killers” – rather than the Saudi state – could be responsible instead. Lawmakers in Congress, meanwhile, are taking a firmer line against Saudi Arabia. Many foreign-policy experts told Business Insider last week that the Khashoggi case could create tension between Trump and the GOP foreign-policy establishment in Congress. Sen. Marco Rubio of Florida also vowed last week that if Trump did not “do something” about Khashoggi’s disappearance, “there will be a very strong congressional response” against Saudi Arabia.